The Funky Felter: A Twitter Milestone and a Mention on Etsy's Storque - Yippee! 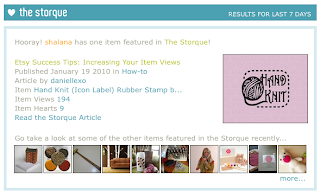 A Twitter Milestone and a Mention on Etsy's Storque - Yippee! I just wanted to share a couple of little happy things with you. First of all, I reached 1,000+ followers on Twitter over the weekend. Yay! I have really found Twitter to be a fun way to communicate as well as advertise. If you'd like to follow me, just click here for my twitter page and please pass it along to your friends too. Anyway, just wanted to pass along my good fortune. I feel very blessed right now for many, many things and hope you have a very blessed week! Thats really great! What a wonderful way to start the week! congratulations on being a feature on Etsy....!